Here is a recent find. A pretty colored "Large Design" Miller's Extra. Lance recently posted his run of Miller's flasks, and showcased some of the colors these popular flasks are found. There has been quite a bit of debate over the years as to whether the "small design" or the large pattern is older. It is still general consensus that the small circle Miller's pre dates the large circle by a few years. They do seem to be found together however. Interestingly, the small circle Miller's comes in green shades much more often than the large circle...not sure why. It is pretty tough to beat any early western whiskey with a green tone to the glass! I have heard reports of broken small circle Miller's in a light pastel green, almost aqua! What a great find that will be someday when some lucky digger discovers one of them. Here is a red whittled glob top fifth that is pretty tough to find. 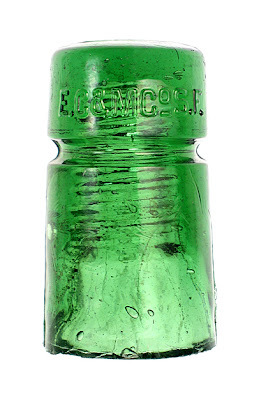 It is one of the 1890s whiskey bottles that for the most part all seem to be very scarce to extremely rare. According to Thomas, Christian and Fred Hilbert operated saloons in San Francisco beginning in 1890. Their most successful establishment was at 101 Powell St. This is the same address that is embossed on this extremely rare fifth. I also have a pumpkinseed flask with this address embossed. To me there is something special about a bottle embossed with the address of a saloon. This saloon operated until 1896 after which the Hilbert brothers operated mainly a wholesale liquor business from two Powell St. locations. Hilbert Bros. In 1898 Fred Hilbert went to work for Hildebrandt Posner, and in 1903 the company name was changed to Hilbert Mercantile Company, until the entire company was destroyed in the great earthquake of 1906. I can account for 6 or 7 of these glob tops in collections, and about the same amount of tooled top versions. I dug a front face of a Hilbert Bros. in Northern California in the late 1990s, but could not determine if it was a glob top or tooled top. I also do not know if any have been dug in any state except California. These continue to be very elusive like the N. Ahrens, Cline, and PMSS. 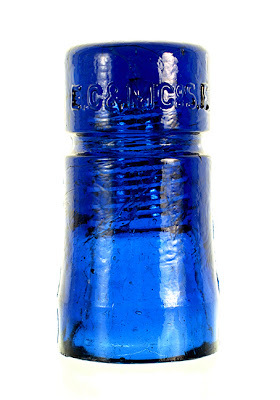 These bottles were almost certainly a product of Germany, and in Warren Friedrich's book there are some interesting news paper accounts of the heavy competition between the California glass industry and foreign suppliers. This is quite a story in itself. While this is not an early 1870s fifth, it is a beautiful and historic link to the liquor industry in San Francisco. This is the only picture I have of a 'Roo. It was scanned to me by the Aussie owner. Yesterday's auction by Graham Lancaster at the Toowoomba, Queensland, Australia, Bottle Show saw some spirited bidding among OZ collectors. A number of local bottles surpassed expectations, with many breaking $10K. 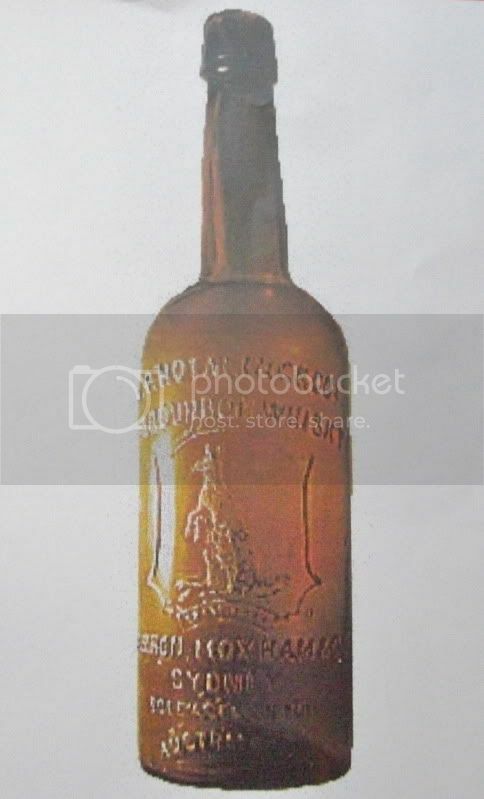 The Hotaling "Kangaroo" Old Bourbon earned $16,000, but from whom I haven't heard. Word among the locals was that the bottle would remain in country as it is considered and Aussie bottle, regardless of the fact that it was blown in SF and contained an American whiskey to be sold in Australasia. I certainly did not have the "chops" to bid so didn't bother. I will patiently await my turn, as more are expected to turn up in the future. Here's the "Last of the Mohicans" applied top Hotaling Sole Agent Cutter. Like the late Rodney Dangerfield they don't get no respect, but these bottles are part of the Cutter story in the American West. Widely distributed, they have been found in great numbers in just about every state west of the Rockies., This example was recently wrenched from it's 125 year resting place in a small Sacramento privy. The body of the bottle displays zero crudity, and, of course, the crown has no jewels, but the top is right of an earlier time. It is very crudely applied and has some serious spillover. That alone makes it a keeper and not relegated to the low end sales box. 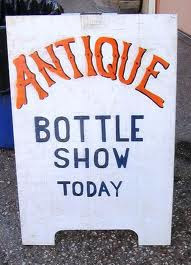 We have the 46th annual Las Vegas Bottle Show & Sale this weekend. Friday and Saturday Feb 18th, 19th. Palace Station Hotel. Show is open from 11am - 5pm on Friday and from 9am - 4pm on Saturday. Cost of entry: $15 on Friday, $5 on Saturday. It has been a strange n' long, old winter for this soleagent. Haven't put a probe in the ground since Oct. Haven't been to a bottle show since last Downieville. I have had some business stuff hanging over my head and finally, finally... it is done. I'm going to make the trip to Vegas this year, just to get some sort of bottle fix! Glass Discoveries and Pole Top Auction #64, (pole top.. p-o-l-e top, I seem to always have a "Freudian Slip" in regards to those heavy bottle breaking chunks of pressed glass) can be previewed on line by clicking on the link in our favorite sites. Some very beautiful bottles, always hoping for more western, but still some outrageous, quality glass. Is there no end to those insulators? Enough already.... sorry, I think I'm just jealous. I wish I had stashed a few of those away back in the day... you know, when I could afford to buy one!! These hard cover catalogs are fantastic. Lots of information in them. Klingensmith.' Catalogues will be mailed in early March. latest information on this exciting sale, to be conducted in March, 2011. Thanks, and Happy Collecting to everyone!